The routine management of labour can change the course of a woman’s labour in important ways, yet women and their partners often have little or no awareness of it. In childbirth medical interventions have known side effects for mother and baby. Often these effects have unintended consequences that are solved with further interventions, which may in turn create yet more problems. This chain of events has been called the ‘Cascade of Intervention.’ This phrase was coined in a pamphlet written by Childbirth Educator Pam England in 1989. It was a picture of a waterfall illustrating how routine obstetric management of childbirth increases the chance of further interventions. Interventions in childbirth that can lead to a cascade of intervention include—using various medications to induce labour, artificially breaking the membranes surrounding the baby and releasing amniotic fluid before or during labour, giving medications for pain relief, augmenting labour contractions, and using back-lying positions for labour or for birth. In many instances, these interventions cause problems because they disrupt the normal physiology of pregnancy, labour and birth. For example, by interfering with hormones that move labour and birth along, by creating opportunities for infection, by interfering with a woman’s ability to push her baby out, or by disempowering her—telling her she cannot do it on her own. What is an example of the cascade? Epidural analgesia can provide very effective pain relief during labour and allow a woman to relax and give birth vaginally. However, medical textbooks also admit that it increases the chance that a woman will experience a sudden drop in blood pressure, a longer labour, difficulty urinating, a slowing down of uterine contraction pattern, fever, difficulty pushing, etc. Because of these possible side effects a variety of interventions have been developed by the medical community to monitor, prevent or treat these above effects. These include the use of synthetic oxytocin to strengthen contractions, continuous electronic fetal monitoring to make sure baby is faring well with the increased contraction pattern, I.V. to have access to a vein (to provide medicine to treat an infection or fluids for blood pressure), urinary catheter to empty the bladder, and vacuum or forceps to help move the baby out. These in turn may have side effects and lead to further interventions (e.g. cesarean section). The impacts can extend to babies. For example, epidurals increase the likelihood of babies to be born with forceps or vacuum extractors. Because women who have an epidural tend to stay in non-gravity friendly positions over long periods of time, and because the epidural encourages pelvic muscles to relax—it may take longer for the baby to rotate and to engage deeply in the pelvis. The baby is also more likely to get stuck in a position that is not optimal which may lengthen the pushing stage. This situation is compounded by the fact that most women do not feel their urge to push when they have an epidural. It makes it difficult for them to efficiently rotate and push their baby. This is why first time mothers with epidurals will often need obstetrical instruments to help them birth. How can women limit a cascade of intervention? This chain of possible effects from epidural and other interventions shows the importance of making careful informed childbirth decisions. However when help is genuinely needed the benefits of intervention may outweigh their risks. Almost every medical intervention has some potential to cause harm. Decisions about whether to undergo an intervention should be made carefully. They should only be used if they are more likely to offer benefit than harm. In weighing possible benefits and harms, it is important to rely on the best available evidence about effects, and also to consider how women feel about the possible outcomes. It is also important to learn about other options that may be available. Unfortunately, it is impossible to accurately know in advance the course of a decision, and the degree to which other interventions and their effects will come into play. The best way to limit the problem of a cascade is to avoid routine interventions whenever possible. Would preparing myself prenatally help me? Yes preparing prenatally is most important. No athlete can run a marathon without months, if not years, of training. Do not wait for your pregnant belly to show or even for the third trimester to start before paying attention to your pregnancy. If you wait this long, you will be running a sprint rather than a marathon— and that is one exhausting race! You will probably take short cuts, and decide on reading What to Expect when Expecting rather than Ina May’s Guide to Childbirth, attend a one day prenatal rather than a five week prenatal series, or worse, only talk with women who only tell you their horror stories. Birth is not a war. Most women are not war veterans who survived the horrors of birth—unless they felt disempowered by their births. But you don’t have to be disempowered. Making your birthing decisions in a place free of fear or pressure is ideal. But how do you do this? The old adage ‘Knowledge is Power’ holds true. The more you know the more empowered you are as it is easier for you to make decisions that are clear, balanced, and appropriate to you. Become familiar with medical and hospital procedures, drugs, tests, and treatments. Read up-to-date research, not just the ones that confirm what you want to believe. Know your pros and cons so you can make informed choices. Keep in mind that educating yourself will provide you with an opportunity to think things through, to slowly run your marathon, and integrate every step. With all this knowledge role-play all situations: What would we decide if? Write down your preferences and make them known to your caregiver. And finally when a birth does not go as one had envisioned it is easy to fall into a place of blame. You may blame yourself, your partner, or your caregivers. However you are as much responsible for your care as your team is. Make sure you take the time prenatally to be responsible for your birth. 1. Choose your caregiver and place of birth wisely. Make sure that they don’t routinely perform interventions. In the absence of open and frank dialogue, look somewhere else! A powerful story I often share is the one of a first time mother who gave birth a couple of years ago. She desired a natural hospital birth attended by an obstetrician. She and her husband had educated themselves and hired me for support. The birth started like many others—slowly but steady. When I arrived at their home this woman was moving around and moaning gently. Her contraction pattern was irregular so we stayed home for a while, wanting to make sure we were at the hospital in active labour. After some time the contraction pattern was very strong and she was eager to find out how dilated she was. We also needed a change of space! So we made our way to the Grey Nuns Hospital in Edmonton and my client’s cervix was checked. She was told that she was 9 cm dilated! We were so happy. The nurse prepared all the equipment for the birth and we waited eagerly for the first signs of pushing. Two hours passed. Nothing. No urge to push. The nurse suggested the epidural would help dilation. She refused. After another two more hours she was checked again: still 9 cm dilated and a little swollen. Four hours of no progress is often considered problematic. She was told the famous words “Failure to Progress” and “You baby is direct OP.” This means that her baby was looking directly at her spine. This position lengthens labour as it requires a lot of rotation and molding of the head. It is a tiring labour and the cause of many cesareans. Perhaps, anticipating her being tired and not being successful at her attempt to birth vaginally a direct OP baby, her doctor advised her to have a c-section. If her caregivers were shocked they did not show it. There was such determination in her voice, that no one dared contradict her. Her husband and I continued our support: double-hip squeezes and breathe awareness. The nurse brought the laughing gas and our doctor offered to insert his finger by the head of the baby during a contraction to help the rotation. She agreed and after a few contractions, suddenly my client felt a strong rotation within her. 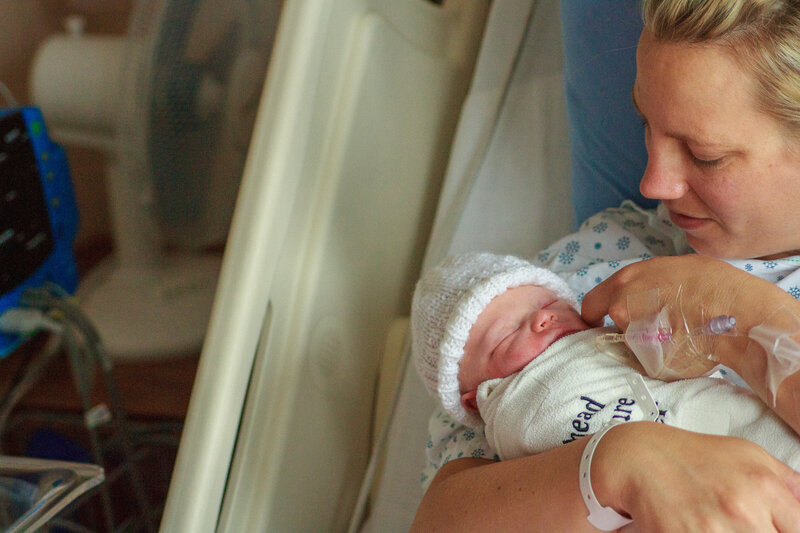 She breathed out and down all the oxygen she could to relax her uterus—to allow the baby to move freely, and… within minutes the baby was in her hands. We all smiled, laughed and cried… including the obstetrician. It was the perfect experience where a team was able to use each other to achieve natural childbirth and maintain a woman’s power. 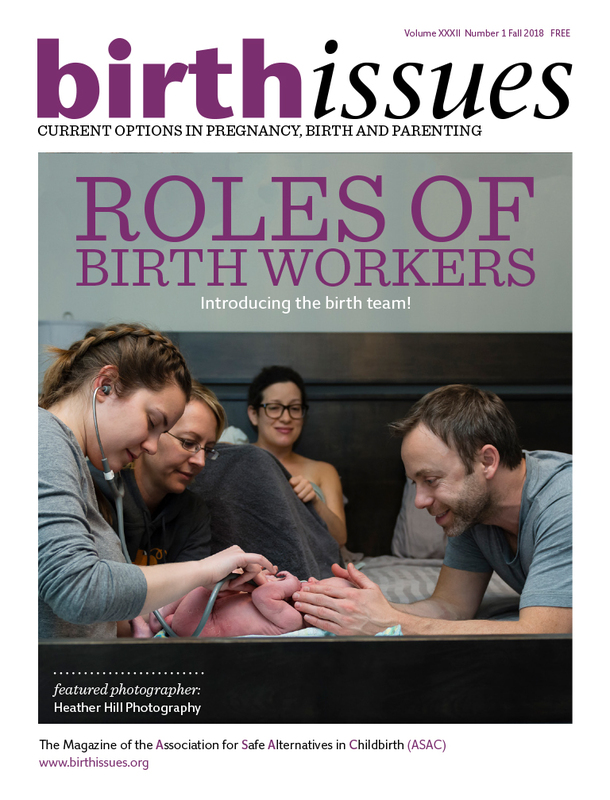 It required every member to be positive, engaged, and in the service of natural childbirth. Claire MacDonald knows that taking charge is not easy but is well worth the time and energy. While waiting to conceive, she spends her time working as a doula and having fun with her beloved husband Michael. – Anim-Somuah M, Smyth R, Howell C. Epidural versus non-epidural or no analgesia in labour.” Cochrane Database Systematic Review 4 (2005): CD000331. – Green JM, Baston HA. “Have women become more willing to accept obstetric interventions and does this relate to mode of birth? Data from a prospective study.” Birth 34, no. 1 (2007): 6-13. – Hutton EK, Reitsma AH, Kaufman K. “Outcomes associated with planned home and planned hospital births in low-risk women attended by midwives in Ontario, Canada, 2003-2006: a retrospective cohort study.” Birth 3, no. 6 (2009): 180-189. – Lieberman E, Davidson K, Lee-Parritz A, Shearer E. “Changes in fetal position during labor and their association with epidural analgesia.” Obstetrics & Gynecology 105, no. 5, prt. 1 (2005): 974-82. – Maassen MS, Hendrix MJ, Van Vugt HC, Veersema S, Smits F, Nijhuis JG. “Operative deliveries in low-risk pregnancies in The Netherlands: primary versus secondary care.” Birth 35, no. 4 (2008): 277-282. – Tracy SK, Sullivan E, Wang YA, Black D, Tracy M. “Birth outcomes associated with interventions in labour amongst low risk women: a population-based study.” Women Birth 20, no. 2 (2007): 41-48. – Tracy SK, Tracy MB. “Costing the cascade: estimating the cost of increased obstetric intervention in childbirth using population data.” British Journal of Gynecology 110, no. 8 (2003): 717-724. – F. Gary Cunningham, Norman F. Gant, Kenneth J. Leveno, Larry C. Gilstrap, John C. Hauth, Katharine D. Wenstro. William’s Obstetrics. McGraw-Hill Professional, 21st Edition: 2001. 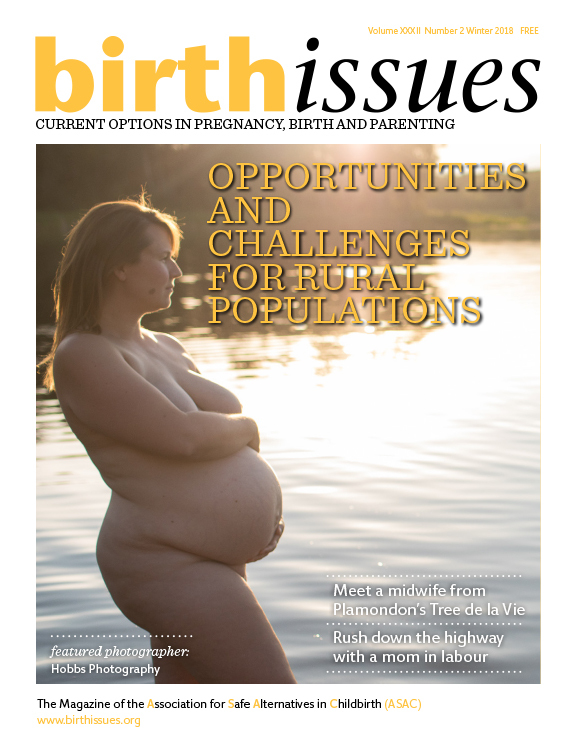 Want to write for Birth Issues? EMAIL us your birth stories, articles, poetry, photos, birth announcements, ads, events, prenatal education class series, lactation consultant and placenta encapsulation services. We also publish your stories and articles on our website.